If you have detected DiscountPlace on the system, you should know that it is advisable to get rid of it as soon as possible because this program cannot be fully trusted. The specialists of pcthreat.com have revealed that DiscountPlace might cause harm to your system’s security because it will display various commercial advertisements on your screen that might route you to corrupted websites. It seems that the program is compatible with all the most popular browsers, including Internet Explorer, Google Chrome, and Mozilla Firefox; however, if you use Chrome, it does not seem that this undesirable application will bother you because Chrome will block it straightaway. As you can see, it is rather risky to keep DiscountPlace on the system, which is why we advise you to eliminate it as soon as possible. The instructions placed below the article will help you to remove DiscountPlace without any difficulties. DiscountPlace will not only show commercial advertisements on your screen, but also do a bunch of other suspicious activities. As our researchers have found out, this advertising-supported application might collect information associated with your activities on the web. Even though it claims that this information will be used to improve the service and provide you with relevant ads only, the truth is that nobody knows where this information is going to be used. In order to transfer this data, DiscountPlace will connect to the internet without your permission. Keep in mind that it will not stop acting suspiciously; thus, you should delete it without any further considerations. As other undesirable programs based on JustPlugIt engine, DiscountPlace might also travel bundled with different kinds of applications even if it has its official website. 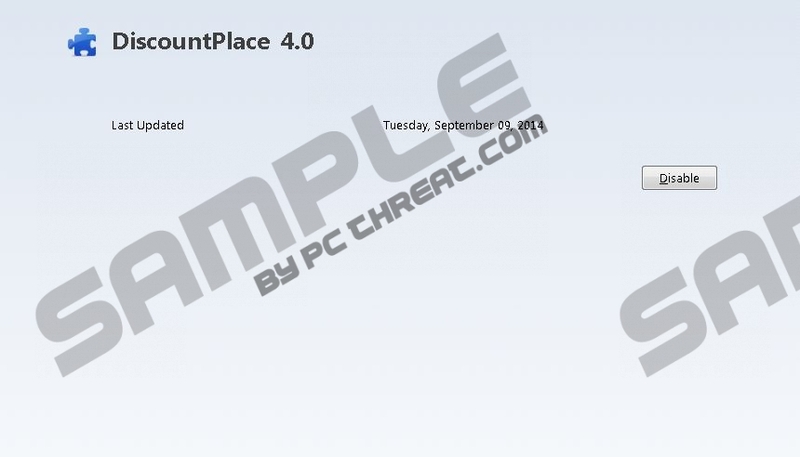 The security experts of pcthreat.com have found out that DiscountPlace is usually distributed via InstallRex installers mainly. Other suspicious applications might use the same method to slither onto your computer; thus, you should definitely ignore various advertisements and buttons placed on different kinds of websites. On top of that, you should not forget to install an antimalware tool on your system. In order to eliminate DiscountPlace and stop all of its suspicious activities, you will have to acquire an antimalware tool and then just simply scan the system. Of course, you can do that manually as well; however, the latter method is more suitable for those who tried to remove malware in the past. The manual removal instructions placed below the article will help you to delete DiscountPlace easily and quickly. Click on the extension. Select Remove. Quick & tested solution for DiscountPlace removal.